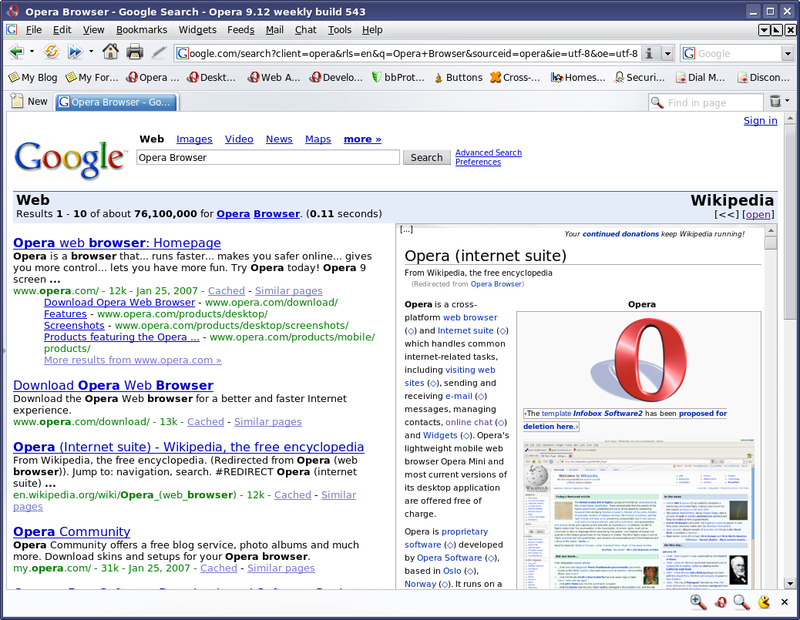 Operapedia is a UserJS script for Opera 8 and Opera 9 that embeds a Wikipedia article relevant to your current Google search right into the Google page (screenshot) (download). If you have any issues, questions, etc then please feel free to post in my Operapedia Forum. 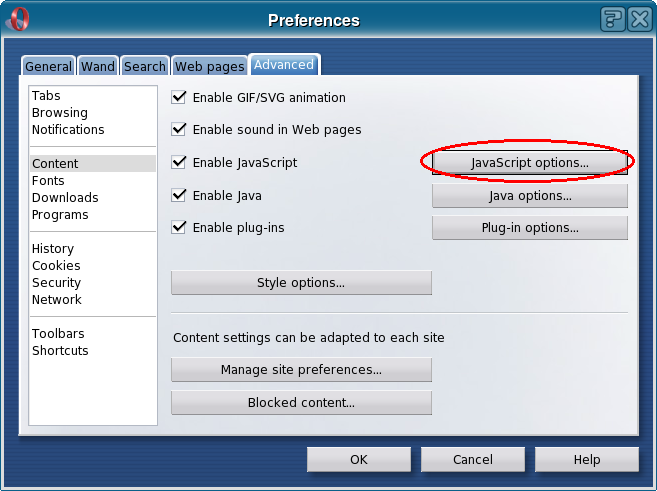 Yes, this UserJS modification was inspired by Googlepedia for Firefox. In version 1.3 the ability for the script to change your Google search as your Wikipedia search changed was added. In recent versions this behavior has been modified so that it does not happen unless you click the little diamond-shaped link in parenthises that follows a link to another Wikipedia article. This was changed to allow you the option to leave you Google search alone, or to change it to reflect the Wikipedia article you are viewing. As of version 1.6 the Wikipedia iFrame will not be shown (by default) if there are no Wikipedia search results for your Google search. This modification was made by scipio. It was suggested in this post on the My Opera Forums. By default the Wikipedia page is displayed in the Google page whenever an article is found that matched your Google search. This can easily be changed so that it only appears when you click a link simply by editing the script. There are some variables at the begining of the script (just after the version list), such as ShowWikipediaByDefault which lets you control if the Wikipedia frame opens by default. The option GoogleLeftWikipediaRight has been removed in version 1.1 as a fix has been added that should allow it to automatically change sides depending on which side of the page Google's search results are on (allowing for better multi-language support). On this page I will attempt to explain how to download this script, and set up Opera 9 to use it (it may be slightly different in Opera 8). If you would like a video demonstration as well, then you can watch this. It shows the basics of setting up UserJS for the first time. 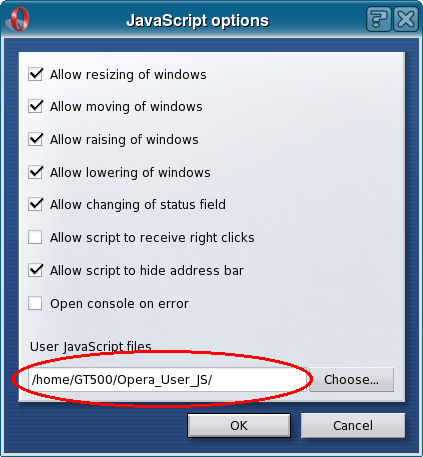 If you already have UserJS set up, you do not need to create a new directory for Operapedia, but simply need to save it in your current UserJS directory. The video is just short of 9MB, and is encoded in Theora. It will play in VLC Media Player, MPlayer, and Xine. To play it in Windows Media Player, you will need to install an OGG Codec that supports Theora video. After all of that, you should now be able to do a Google search with integrated Wikipedia results in the Opera Web Browser.